Lexington, KY – For customers across the globe, Link-Belt is proud to announce the solution for expanding the top-end of telecrawler fleets with the highest capacity telecrawler currently available in the market. 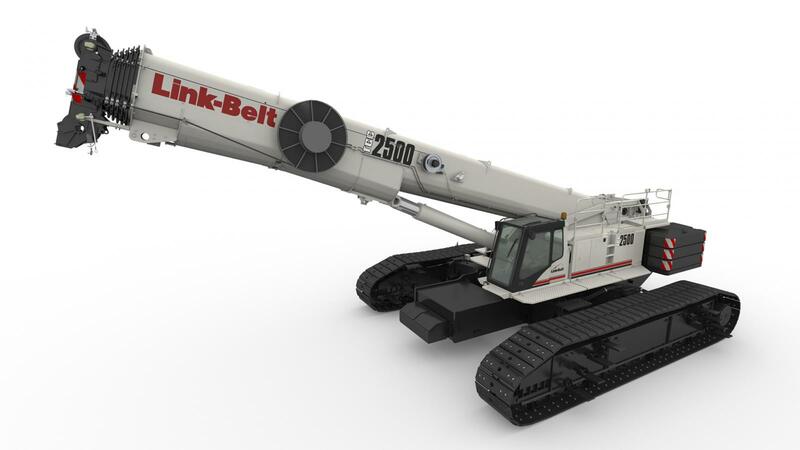 Link-Belt is unveiling the all-new TCC-2500, a 250-ton (227-mt) telescopic crawler crane to its market leading lineup. The TCC-2500 will make an outstanding addition to any general construction, power transmission, wind farm, power industrial or large crane rental fleet. “The long-term plan for our telecrawler lineup brought us to this point in time, and the TCC-2500 is well positioned to lead the telecrawlers into a whole new arena of jobsite opportunities. 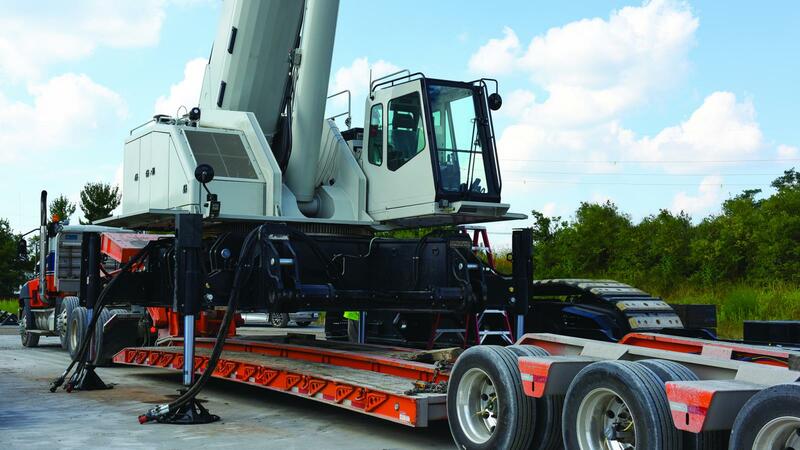 We identified early on that our customers needed a telecrawler with higher capacities and greater reach,” says Link-Belt Product Manager, Lattice and Telescopic Crawler Cranes, Scott Knight. The TCC-2500’s job site flexibility is a huge benefit. The TCC-2500 can lift, reach, and travel like a large fixed boom lattice crawler, while also having the ability to retract the boom and reduce its overall profile as job site conditions and environment require. The TCC-2500, with its Tier 4 Final Cummins QSL 9 diesel engine and seven-section formed boom, will make a public debut in Las Vegas, NV at ConExpo 2017 March 7-11. Production units of the TCC-2500 will be ready for shipment in March. Since entering the market a dozen years ago, Link-Belt’s TCC progression of high quality products, innovation, and market share dominance have been textbook. When first introduced in 2005, the product line won early praise as a niche market solution to ease off-road maneuvering common for powerline utility applications, but Link-Belt TCCs have steadily grown into rental and general construction fleets both domestically and abroad. Sales of Link-Belt telecrawlers remain strong in a number of key international markets including Australia, Europe, South America and Singapore, with North America leading the charge! Overall, the TCC-2500 establishes a new definition for robust performance for large telescopic crawler cranes. The seven-section 43.7 – 223 ft. (13.8 – 67.9 m) pin and latch boom is the longest in class and offers eight simple boom extend modes. The attachments will also be sure to impress with a three-piece offsettable fly that measures 12, 40, and 67 ft. (3.6, 12.1, and 20.4m) and can also be equipped with two 25 ft. (7.62 m) boom extensions for an overall tip height of 346 ft. (105.46 m). These attachments with optional hydraulic luffing allow for “up-and-over” capacity like luffing lattice crawlers. “Our goal from the beginning was to supply a simplified design, quick and easy to assemble that is operator friendly,” says Knight. Another key feature for this 250-ton unit is an extra wide winch design that can handle its maximum permissible line pull through the fourth layer – front and rear winches are matching. The rear auxiliary winch can be removed for transport weight reduction and a power pinning system mitigates work at height exposure. The TCC-2500 is a purpose-built design like the rest of Link-Belt’s TCC line, not an all-terrain upper conversion. Operators will appreciate the new 10 in. (25.4 cm) full color display that incorporates both RCL and engine data. The display has been carefully selected to have a resistive touch screen that can be used with gloves and be seen in direct sunlight with larger, clearer images on display. Electric cab controls come with unparalleled functionality and increased customization and ergonomics. Operator job site view is enhanced with four cameras: rear-view, blind-side swing-view, and two individual winch-view cameras that provide increased job site awareness and control of the job site from inside the cab. Track gauge for the TCC-2500 is rock solid at 20 ft. 4 in. (6210 mm). The lower carbody is a hook and pin system which will make assembly quick and easy. The TCC-2500 can self-assemble side frames with standard equipped car body jacks and wireless remote control for hydraulic pinning and jack operation. Customers will utilize new two-bar grouser track shoes that provide excellent traction with standard nylatron pad inserts to protect sensitive ground surfaces when needed. One of the most important things about the TCC-2500 is its ability to move quickly and easily on or off the job site. The main transport load weighs under 106,000 lb. (48 000 kg). The TCC-2500 can be assembled with far fewer and less complicated steps than the competition. Once off a trailer, carbody jacks can be deployed via remote control. On jacks, the crane sits wider than the competition for a solid self-assembly platform with hook and pin side frames that hydraulically pin. 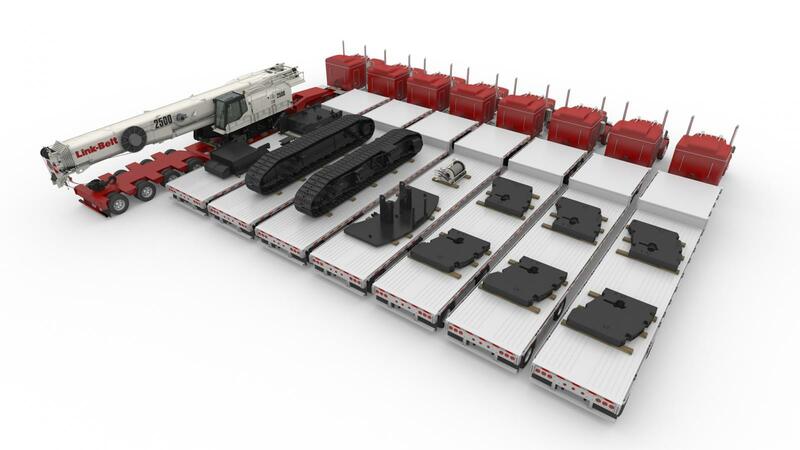 Link-Belt’s proven TCC counterweight system attaches 154,000 lb. (69 853 kg) of upper counterweight and is a 9-piece modular design (allowing for partial counterweight capacity charts) and transports on seven overflow loads, all 44,000 lb. (19 958 kg) or less.